The American Association of Orthodontists has recommended that all children should have an orthodontic evaluation by seven years of age. 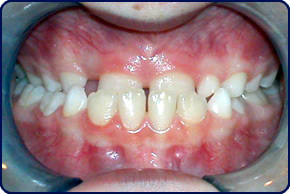 This does not mean that every child with an orthodontic problem will be ready for treatment though. 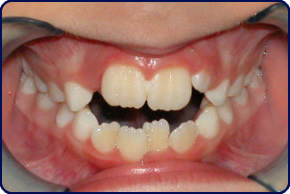 The purpose of the evaluation is to detect any problems that would have a better treatment result by initiating early orthodontic care. This is usually referred to as Two Phase Treatment. The first phase is to correct the larger problem that exists. A second phase of treatment is usually required after all of the permanent teeth have erupted to put the finishing touches on that perfect smile. 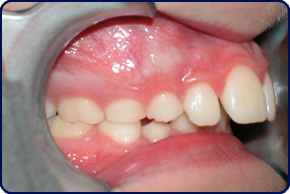 If your child can be successfully treated in one stage of treatment (most kids), we will evaluate the eruption of the teeth at a short appointment once every six to twelve months until he/she is ready to start. By following this schedule, we can start treatment at the most opportune time for best results. 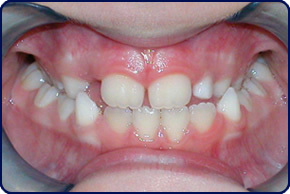 Crossbite: This is when the upper jaw is too narrow. Open bite: This situation often occurs with late thumb or finger sucking. Severe skeletal problems: These would include very large overbites or underbites.